Kids should fight for their dreams - not their lives. Brain tumors are the leading cause of cancer death in children. We are funding promising research and finding cures for these potentially devastating childhood brain tumors. Daniel was 9 years old. He had been complaining of headaches for two weeks. When he began vomiting and sleeping during the day, his parents took him to the emergency room where they did a CAT scan and discovered a large mass in his brain. After a 15 hour surgery, which removed 75% of the tumor, he was told there was nothing else to do. He would have to wait and see if the tumor would continue to grow. Daniel will never have a normal childhood. He will spend his childhood fighting his brain tumor. Jamie was diagnosed with a brain tumor on her brainstem when she was 11 months old. In the next 4 months, she required NINE surgeries to try to remove the tumor and to fix complications resulting from earlier surgeries. Side effects of the surgeries have left her immobilized on her right side. The prognosis for these kids is not good. 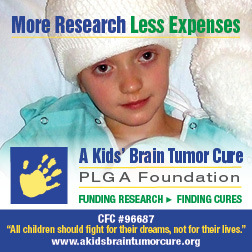 There are NO known effective treatments or a cure for kids with brain tumors. Current chemotherapy and radiation treatments are poisonous and ineffective, yet it is all we have today, so parents are left with little choice. New research can change the outcome for these kids. More effective treatments and a cure are possible. But funding is needed to make a difference. Help these children fight for their dreams, not for their lives. Give generously.